As highlighted recently in our blog, at Nicol Estate Agents we are proud to continue serving the East Renfrewshire property market with a proven, traditional business model we know works including a prominent high street presence and an experienced local team, as well as a NO SALE NO FEE commission structure, rather than an ‘upfront fee’ arrangement paid whether you sell or not! With our 100 years of combined experience on the local property market we can be sure that any agent that charges an ‘upfront fixed fee’ simply cannot be as incentivised or motivated to sell your home for the best possible price, compared to an experienced Estate Agent, like ourselves, who has to sell your home to be paid their fee! That’s why at Nicol Estate Agents, we know we will work harder to sell for you at the highest possible price. So, why do we believe a commission based model works in the best interest of our clients? At Nicol Estate Agents we are very motivated to market your home in the best possible light with bespoke brochures and professional photography.We also ensure that your property has a strong online and media presence and that every sales opportunity is explored and utilised. It is in both our best interests, as we don’t get paid our sales fee unless your home sells. We are also motivated to sell your home for the best possible price, as our commission depends on the final value of the transaction. At Nicol Estate Agents we have the resources, an extensive qualified database and an excellent sales team to provide advice, guidance, feedback and sales support throughout your sales campaign until conclusion. In order to generate the most interest in your home and achieve the best possible price, our experienced team and our highly experienced negotiators will work tirelessly on your behalf to secure a successful sale. This is a highly refined process we’ve perfected over the years – and it works to the delight of our clients and at no extra cost to them. – Anthony Jacob, home seller. “Any agent who has been paid a fee upfront (a fee paid regardless if they sell or not) will not be as motivated as us. 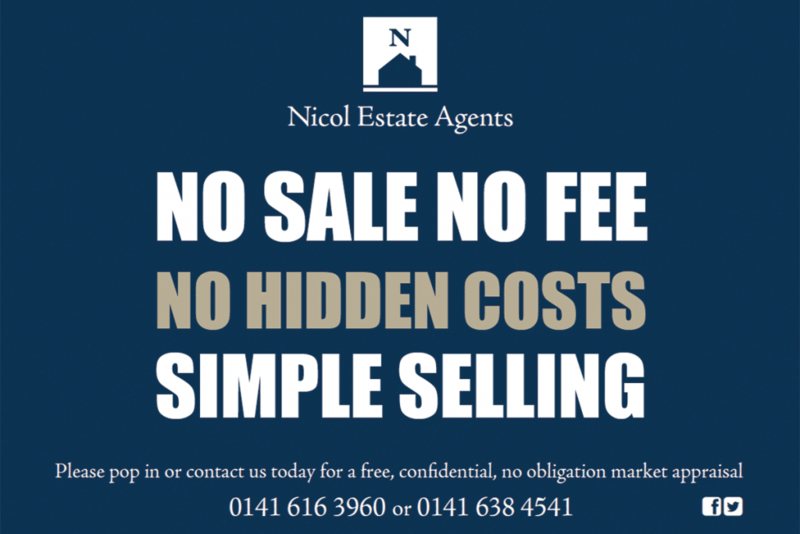 At Nicol Estate Agents we work on the basis of a No Sale No Fee commission, to obtain the best price for your home. In our many years of working within the property industry, we have seen that what is perceived as ‘short term’ savings with an upfront cheap sale fee package, can quickly turn into a financial loss or complete disappointment when the house sale campaign fails to raise interest.” Douglas added. At Nicol Estate Agents we believe that our people and our experience sells homes and that our personal approach achieves results. Moving home is not complicated but it can be daunting, as your home is one of the largest investments you will ever make. Although the Internet has the changed the world, buying and selling property is a very people oriented business and good communication is essential for a successful move. With over 100 years’ combined experience, an extensive qualified database of home buyers, proactive marketing and a proven track record of success, our knowledgeable and experienced sales team live locally and are available 7 days a week for help and advice. At Nicol Estate Agents we value quality over quantity and there is no one-size fits all policy. We consider every home and every seller individually. So if you want an Estate Agent that puts you at the heart of their business, contact our Newton Mearns and Clarkston teams today.